UPDATE: According to a video of the event, Justice Scalia’s quotes were taken out of context, at least regarding Brown v. Board of Education. The newspaper altered its story. It’s not really clear what happened, but I think my quotes below are still accurate, so I’ll leave them up. Ugh, I am so disgusted by what I just read on Huffington Post. Apparently, Supreme Court Justice Antonin Scalia would have dissented if he had been on the court for Brown v. Board of Education. This is a man who has 11% of the ultimate responsibility to uphold my rights and he’s still hung up on change that happened 55 years ago? Perhaps he thinks that slavery should be legal, or that black Americans should only be counted as 3/5th. I mean, that’s what the Constitution originally said. Women shouldn’t be able to work or vote, either. I mean, after all, there was no provision for suffrage in the original Constitution. He probably thinks I should apologize to all my friends of color I went to school with for pretending I was okay with them being there when really I should be secretly appalled at their special invented right to go to school with me. And we’re supposed to respect this man’s judgment when he can’t make his point without invoking Godwin’s Law (a preposterous reference to Hitler inventing a car)? Please. This man’s way of thinking is archaic and it is disgusting that he holds such a prestigious position. 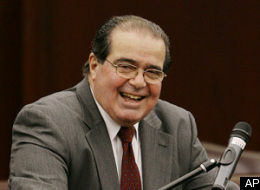 There are 1 Comments to "Really, Scalia? Does “Originalist” Mean You’d Own Slaves If You Could? (UPDATED)"
Constitutional Fundamentalism. It works the same as Biblical Fundamentalism: the ancients were wiser than us. We are unworthy to judge their words.